Are you thinking on going to Barcelona by bike? Or maybe getting out of Barcelona by bike? Anyway, if you enter or leave, if you are commuting or training, in this article we are going to explain you the best ways to exit or enter the county city. In this article we are talking about linking Barcelona to cities less than 8 Km away of its limits. We’ll start from South and go ahead in clockwise sense. Sorry all cycling mates from Girona, Tarragona and Lleida for this centralist mentality but 40% of Catalan population lives packed within this area (Àrea Metropolitana de Barcelona). South side of Barcelona has the harbor and Montjuïc hill (even if in many maps you can find it on the left, it doesn’t mean this is on the West, they just turn it slightly to center the map in an optimized way). Going up Montjuïc is not a good idea because, even if it’s not that high, slopes are steep. Even though the Barcelona’s Ronda Verda crosses this mountain, this is not a good option for mobility, because bike paths are nor segregated nor continuous. We are going to do it better next time, keep on. 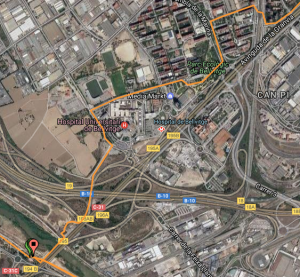 1st Barcelona’s scape way: Gran Via to L’Hospitalet and El Prat de Llobregat. Just tangent to the magic mountain, Gran Via de les Corts Catalanes scape from Barcelona. 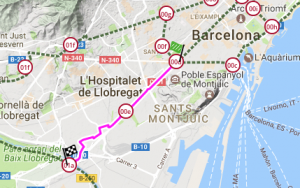 This allow us leave Barcelona behind and cross L’Hospitalet de Llobregat in a pretty straight way. 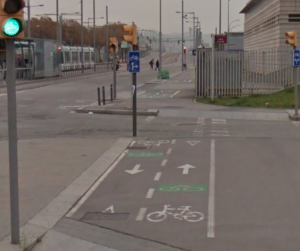 The bike path has some basic design mistakes but we are not going to talk about it here. 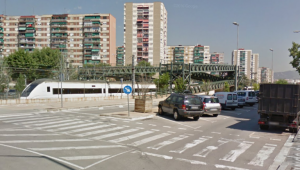 In Bellvitge we are forced to use a bridge to cross the railway. We are forced to use this bridge to cross the railways. 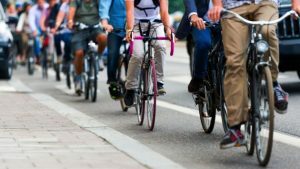 We must admit that it has been a big effort to build bike paths, even if this has been made without taking into account other more experienced cities recommendations. In this picture we can see that the bike trajectory is not straight. Moreover, bike lanes are not connected. This track finishes at Llobregat river. 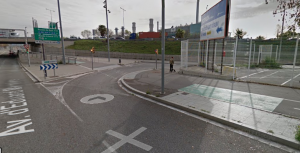 It’s already El Prat commune, but not urban streets. If we want to reach this city, we can go down the river and get into its streets easily. 2nd Barcelona’s scape way: Diagonal to Esplugues, Sant Just Desvern and Sant Joan Despí. 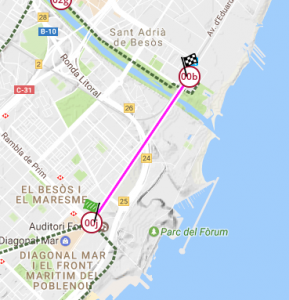 7 kilometres are between plaça Francesc Macià and TV3 (National Catalan Broadcast). I think that some journalists could bike commute there. Next in/out way from Barcelona is scaping along avinguda Diagonal. 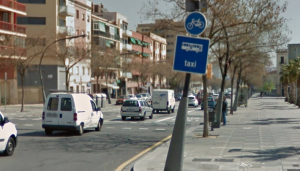 Breaking its ortogonal layout, Ildefons Cerdà himself foresee this avenue to save kilometer in movements inside the city. At the same time, this was planed in a way that heads to Llobregat river in order to ascend it. In this way, this infrastructure is planned to bypass Garraf massif and link populations along the river. There are many bike lanes along Diagonal. There are many planning and execution mistakes as well, but well, it’s a nice starting point. If we take as origin plaça Francesc Macià, we can leave Barcelona up Diagonal and get into Esplugues, Sant Just Desvern and Sant Joan Despí. All they are connected by streets and you don’t realize when you are leaving one and getting into the next. It’s really a metropoli. 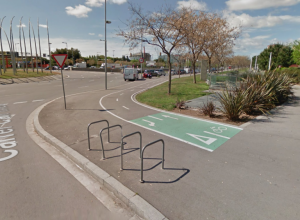 We are waiting for the connection between Barcelona and Esplugues, the elongation of Diagonal avenue dedicated to bicycle. We’ll update this article when it’s ready. 3rd Barcelona’s scape way: Meridiana to Santa Coloma de Gramenet and Montcada i Reixac. Between Collserola and Marina sierras, there’s a natural corridor made by Besòs river. Traditionally used (La Roca road and old N-152 Ribes de Freser road, now C-17). 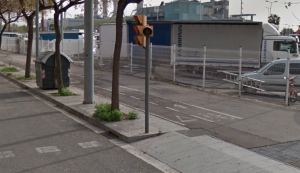 Cycling Meridiana is even worse than cycling Diagonal, we hope than in the next years there will be really an investment in bicycle mobility and the situation gets better. We leave Meridiana when crossing passeig Santa Coloma. There we can cross Besòs river (or not) to go up the river and go ahead to reach Montcada i Reixac. Anecdotally some pieces coincide with ronda verda. Cute. Passeig Santa Coloma: apart from dotted way on the sidewalk (somebody knows what does it mean?) we can share lane with buses and taxis. It’s always a pleasure. 4th Barcelona’s scape way: Guipúscoa to Santa Coloma and Badalona. Acording Cerdà urbanistic plan, the way out of Barcelona to Maresme should be the Gran Via de les Corts Catalanes. Anyway, cycling Guipúscoa street is far better. Less than 4 kilometres let us link El Clot quarter in Barcelona with neighbor cities Santa Coloma de Gramenet and Badalona. Think about it next time underground workers are on strike. 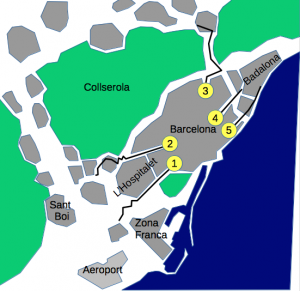 5th Barcelona’s scape way: Diagonal Mar and Fòrum to Sant Adrià and Badalona. Vila Olímpica, Poble Nou, La Mina and Fòrum quarters have a good connexion with Sant Adrià and Badalona. Partially ronda verda is used. 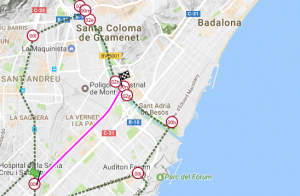 the most important thing of this way is that, it’s not only heading us to Badalona, but its bringing us to Maresme county, where a lot of people get in and out Barcelona. 1- Half of the Barcelona borders are coast. Despite of this, it doesn’t exist any kind of public transportation that uses the sea. There’re cities that uses rivers to transport people and goods. In Barcelona and in Catalunya (except some ferrys to cross Ebreriver) this formula is not used. 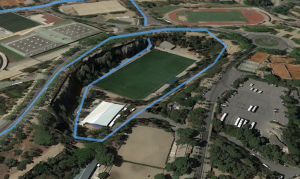 Then, we don’t recommend it now, but who knows if in a uncertain future with a Ronda Litoral sistematically blocked, could a ferry between Gavà to Forum (or Montgat to Barceloneta be worth? 2- As commented before: climb Montjuïc. The logical mobility tell us to avoid slopes. 3- If half of Barcelona perimeter is next to the sea, the other half is next to the mountain: Collserola. This sierra, guilty of Barcelona’s microclimate, forbid us to have a fluent communications with Vallès county. Too much slope.